My recent obsession with public art lured me to storefronts downtown where previously dreary facades have recently acquired original artwork. On South Wilmington St., outside what was once the Old Raleigh Sandwich Shop, I observed the signature style and expressive color of artist Patrick Shanahan, without knowing the purpose. A bit further along the same street, Sean Marlin’s faux bakery storefront installation had me pining for an immediate bagel, and over at Hue on Hargett the window display by ARTHOUSE was quite intriguing. There was something afoot. 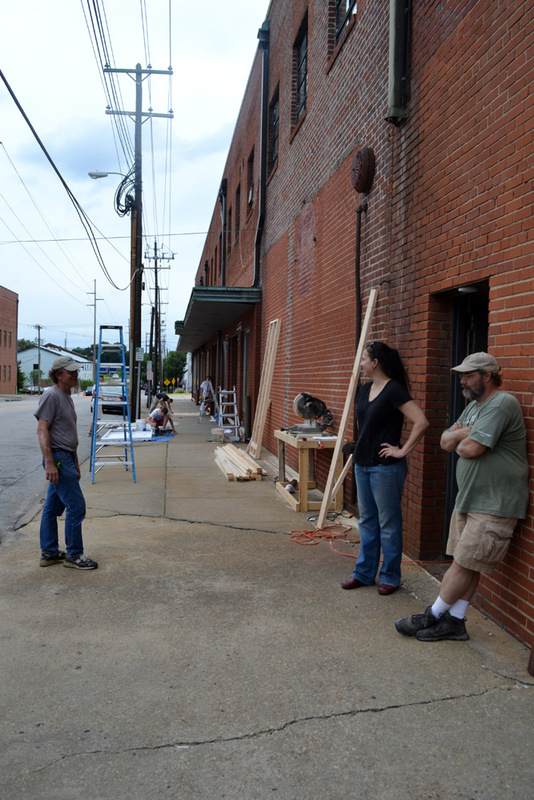 The tour de force behind the facade metamorphoses is a local group known as BEST (Beautifying Emerging Spaces Together). 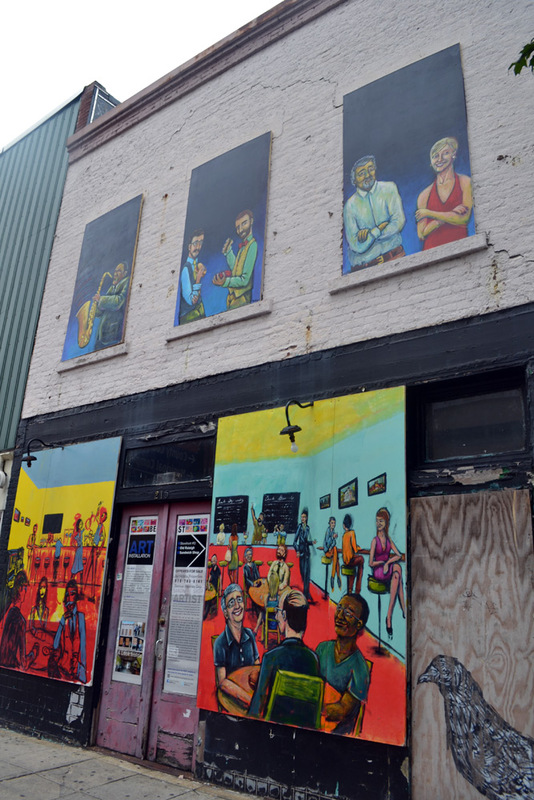 With the help of volunteers and local artists, BEST transforms vacant storefront space into canvases for artistic expression. These once-void expanses are exploding, one by one, into inspired visionary wonders that rep Raleigh’s past and future, giving the public creative inspiration, while drawing attention to the potential the empty spaces encompass. Last Thursday BEST began actualizing its most recent scheme upon the shell of the old Dillon Supply Company in the warehouse district. Throughout the weekend, volunteers gathered to prep the expansive space that will soon become a large-scale painted mural. 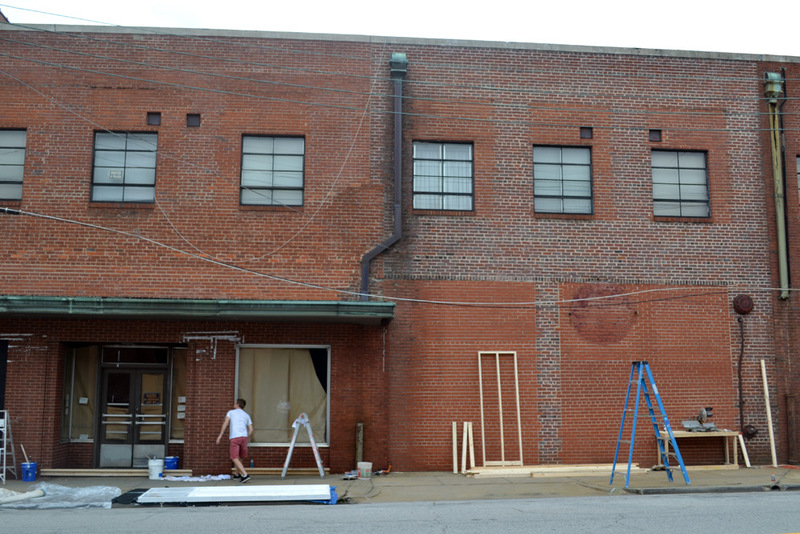 When I arrived Friday afternoon, a team of artists and volunteers were beginning the process of securing plywood coverings over windows to create one continuous surface where the mural will be painted. Artist Bill Beatty was on the scene and enthusiastic about the endeavor. He described the BEST project as a way to encourage public thinking about art while providing local artists a medium and opportunity for expression. 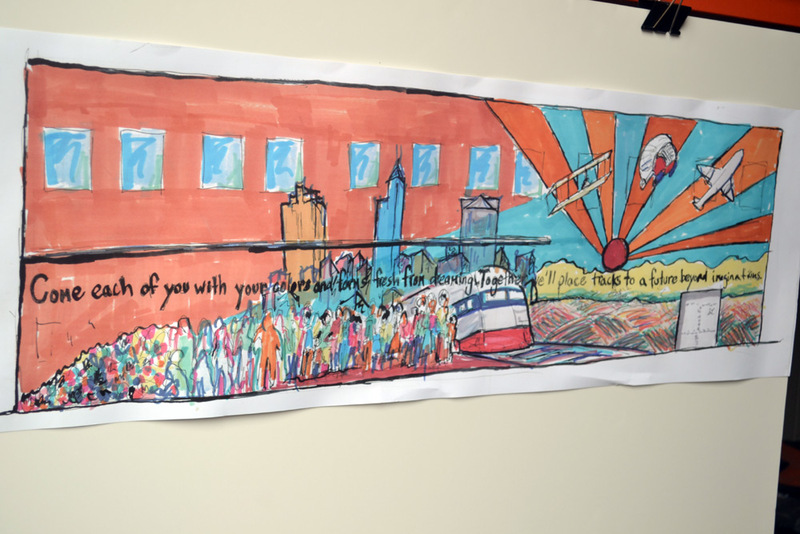 I caught a glimpse of the mural’s design, a colorful panorama imagined by Patrick Shanahan, featuring the Raleigh skyline amidst a crowd of humans and varioustransportation imagery, a shout-out to the building’s current owner, the Triangle Transit Authority. The mural will be a collaborative effort produced by many artists over the coming months. Stop by South West St. to check out the progress and lend a little encouragement to our visionary friends. Written by local Creative Genius, Katie.